What Are The Most Common French Bulldog Skin Problems? French Bulldogs are prone to having problems with their skin. Fortunately, there are several ways to help your dog from experiencing the symptoms of these skin conditions. 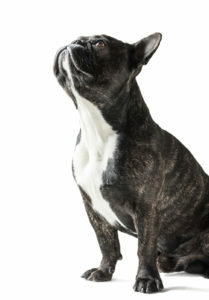 The most common skin problems for French Bulldogs are food and environmental allergies and fleas. If your French Bulldog has skin allergies, it’s common for secondary bacterial infections and yeast infections to form. Less common skin problems include autoimmune skin disease, keratinization abnormalities, ringworm, sarcoptic mange mites, Demodex red mites, and skin cancer. Genetics cause food allergies in French Bulldogs, but a dog will start experiencing symptoms when it’s exposed to allergens. The most common allergens are beef, chicken, soy, pork, dairy, wheat, eggs, rabbit, fish, and lamb. Just like with food allergies, your dog will only start experiencing symptoms when they are exposed to environmental allergens. The most common allergens are pollen, animal dander, mold spores and dust mites. Fleas can be caused by tapeworms, flea-borne typhus, cat flea rickettsiosis, and flea allergic dermatitis. The most common cause for fleas is flea-borne typhus. It’s caused when fleas from another animal drop on the ground and then jump on your pet. The immune system attacking the cells responsible for forming blood clots. The immune system attacking the body’s red blood cells. Keratinization abnormalities show up as dry and scaly skin. They can be caused by genetics, allergies, endocrine disorders, autoimmune disorders, parasites, dietary deficiencies or malabsorption disorders. Sarcoptic mange mites are caused by the sarcoptes scabiei mite which burrows through the skin causing intense itching and irritation. This condition is extremely contagious. Demodex red mites are caused by a parasite that lives in the hair follicles of dogs, they show up as an itchy, red skin condition. The exact cause of skin cancer in dogs isn’t known, but there are some risk factors. Those risk factors include genetic predisposition, trauma to the skin, sun exposure, sun damage, viruses, hormonal dysfunction and dogs over the age of seven years. You can minimize the effect of environmental allergies by using a hypoallergenic shampoo, using biotin supplements and wiping your dog down using hypoallergenic wipes. For food allergies, you can minimize the risk by feeding your dog hypoallergenic dog food, but it can be expensive. If you prefer another option, you’ll need to determine what your dog is allergic to by using an elimination diet so that you can avoid feeding them the allergen. One popular allergy maintenance solution for Frenchies is to feed them chewable allergy supplements. Our pick is the Zesty Paws Allergy Immune Bites, a product with a whopping 1,800+ positive reviews on Amazon. If you can afford it, flea medication is the best way to prevent your dog from getting fleas. As well, be sure to keep your yard clean to prevent infestations. There’s no way to prevent autoimmune skin disease, but giving your dog vitamin E or vitamin C can reduce their risk of experiencing symptoms. Unfortunately, there’s no way to prevent keratinization abnormalities, but you can reduce the risk of your dog experiencing symptoms from the disease by bathing them using moisturizing hypoallergenic shampoo. Using a hypoallergenic shampoo or one that contains oatmeal can help to relieve some of the discomfort associated with the condition. The best way to prevent ringworm is to give your dog prevention medication from a veterinarian. Make sure that your dog has a healthy diet and plenty of exercise. A healthy, strong immune system is important, and a healthy diet will help with that. The best way to prevent Demodex is to get medication from your dog’s veterinarian. If you can’t take your dog to a veterinarian, be sure that they have a healthy diet and live in a clean environment. Be sure to apply sunscreen to your dog when it is exposed to the sun. The sunscreen you apply shouldn’t contain certain ingredients because it can harm your dog if they lick it off. You should choose a sunscreen that’s specifically made for dogs. Dogs are more likely to get cancer in spots where there isn’t a lot of fur to protect their skin, so apply sunscreen diligently in these places. To keep your pet as healthy as possible, you should feed your dog food that’s free of chemicals, preservatives, hormones, antibiotics, butylated hydroxyanisole, ethoxyquin, and glutinous grains. Be sure that the food you feed your dog has plenty of antioxidants and nutrients. Also, it’s important that you keep your Frenchie in an environment that doesn’t have toxic substances and stress. If your dog has a disease that’s caused by an irregular immune system, the treatments above can help regulate it and relieve symptoms.